The Burgundy Musashi Samurai Sword features a beautiful, hand forged 1045 high carbon steel blade that is razor sharp. The blade has been forged using the kitae method, Muku. The handle features a geometric design tsuba and a black cord wrapped grip. Includes a burgundy scabbard with matching cord wrap. Beautiful. Light. Sharp. Straight. Tight. Perfect. I have several Musha swords. This is officially my favorite. I'm in love. Thanks BudK! I really didn't expect much from this considering the price but it came straight, decently polished and sharp. Initial light cutting on 2 liter bottles was impressive. Handled hanging denim pants leg stuffed with wet newspaper with no issues, clean cuts. Everything fit, and all wrapping tight. Scabbard was a bit tight in the last inch or so but slowly breaking in. Could have done without the fake hamon, just not needed, would have rather blade was left alone. Sword bag suitable for budget price. Sword A+++. Scabbard A++ (a bit tight). Shipping speed A+++. Packaging and extras A++. If you've been on the fence don't be, this has to be the BEST budget functional sword deal ever. 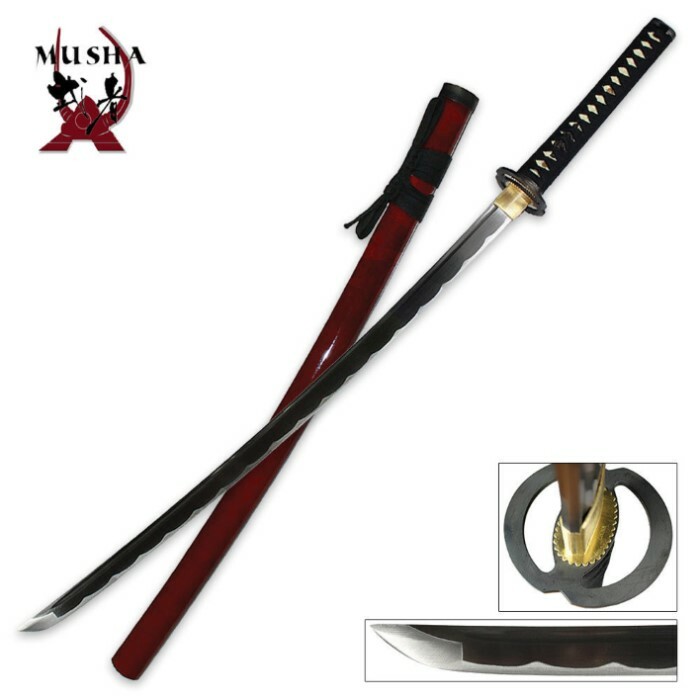 Ordered this nice burgundy katana and it got here within a few short days. Feels very sturdy and the blade is pretty sharp. I can't wait to use this with my authentic samurai kimono outfit for my daughter's costume party and for many other events to come! It is definitely worth the price. I just reviewed this as my first order from TrueSwords and WOW! Not only did I get a beautifully crafted sword exceeding my expectations. Battle ready,full tang and very sharp right out of the box. The customer service was awesome. I had called to check on the delivery time estimate and the customer service did as good a job as the sword was crafted. Great job,great sword, great experience. ordering was simple, shipment came fast. FULL tang blade & SHARP, I would've been a happy customer with those two facts alone but all pieces are TIGHT and the scabbard is beautiful painted wood. Was just looking for another practice sword for under 50$ ... I would put my life on line with this sword w/o hesitation.